Of all the groups to come out of Liverpool during the beat boom of the 1960s, the Big Three were perhaps the most highly thought of locally. Although only a trio, they had one of the loudest sounds and this high volume level possibly helped suggest the group's name. Johnny Hutchinson and Adrian Barber had previously been members of a group called the Cassanovas who were led by Brian Casser (Casey Jones). They were in fact one of the very first beat groups to assemble on Merseyside. However, Casser departed soon after the arrival of bassist Johnny Gustafson and the original membership of the Big Three is generally recognised as the line-up above. However this line up did not last long. Like many of the groups of their day the Big Three made frequent trips to perform on the Hamburg circuit. It was during one such trip, shortly after the band's signing to Brian Epstein, that Barber decided to quit and stay on at the Star Club as stage manager. He was replaced by Brian Griffiths- a member of another popular Liverpool band, "Howie Casey and The Seniors", and one of the most accomplished guitarists ever to come out of Merseyside. The reason for Adrian Barber's departure is a matter of conjecture and folklore. The EP featured on the left is probably now the best way of recapturing their original sound. Despite the less than ideal recording conditions, this disc with its introduction by Bob Wooler is perhaps as close as one can get to hearing how this legendary three piece sounded during those few wonderful years of the early 1960s. It was this line up of Hutchinson, Gustafson, and Griffiths that went on to record. However, although their first release has subsequently become a collector's item, it was not well received and certainly bears little relation to the sound of their stage performance. In fact their recordings in general are not representative of what they were used to playing and this is the reason frequently quoted for their lack of success with singles. Certainly they didn't always see eye to eye with their manager. The group were too unconventional to become another Beatles or Gerry & The Pacemakers. Consequently, the relationship did not see out 1963 and personal differences between group members led to its break up shortly after. The band was brought together subsequently, largely through the enthusiastic efforts of Johnny Hutchinson and at times included members gleaned from other local groups including Faron's Flamingos and the Mojos. Another effort to put things back together was made in 1973 with Johnny Gustafson, Brian Griffiths along with the drums of Nigel Ollsen instead of those of Hutchinson. A re-release was made of "Some Other Guy" which was put out by Polydor together with an album- optimistically entitled "Resurrection". 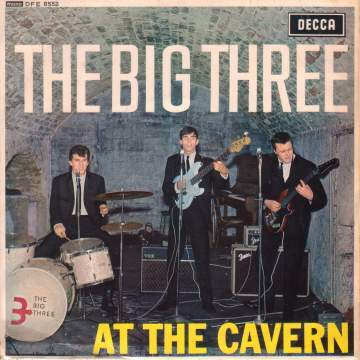 However, it was probably just too late by then and "The Big Three" remain one of the most interesting of the unfulfilled dreams ever to have come out of the Liverpool beat scene of the 1960s. Thanks are due to Chris Wharton who helped with the above.